Investment advisers support President Donald J. Trump’s effort to allow people to keep money in their retirement accounts longer. 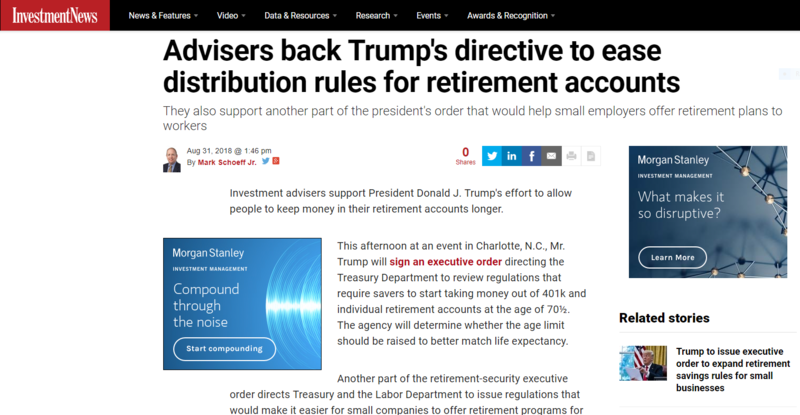 This afternoon at an event in Charlotte, N.C., Mr. Trump will sign an executive order directing the Treasury Department to review regulations that require savers to start taking money out of 401k and individual retirement accounts at the age of 70½. The agency will determine whether the age limit should be raised to better match life expectancy. Another part of the retirement-security executive order directs Treasury and the Labor Department to issue regulations that would make it easier for small companies to offer retirement programs for their workers. The revised rules would enable more companies to participate in multiple employer plans, which reduce costs and administrative burdens. Many advisers were receptive to adjusting RMD requirements.